Received mine today, oh my, this is so worth it, this is such a unique feel that out class any cherry switches or buckling spring variants. I am so glad I made the purchase. One small thing though, seems the paint on the key caps are not evenly spread out, this is a minor issue though, the quality of the board and the feel of the switches just out shines this little problem. The construction of the case is extremely high quality, the keycaps are high quality, the topre switches (which is why the board costs this much) are amazing. They have very little wobble, and feel much more consistent than cherry mx. They are definitely more tactile than any of the tactile MX switches. If the lack of keysets available for this keyboard deter you, there are sliders you can buy that will convert the stems to be MX compatible. Jtk sliders, and novatouch sliders will work. Just be aware that this keyboard has 2 left shifts, so you'll need an extra left shift as the right shift in your keyset will not fit. Also worth noting that the spacebar is 6u, so it would be best to leave the topre slider on the spacebar, because most keysets do not come with a 6u spacebar. There are several topre spacebar options that will likely match your set, so it's not really an issue. Silencing rings (dubbed 'hypersphere silencing rings', found on ebay when "topre silencing rings" is searched) can also be installed, which makes this keyboard very silent, but still has the satisfying thock which topre is known for. Normal mx o-rings do not work with topre. There is also a controller for the fc660c being developed right now, release date in a month or 2, and prototypes are already in circulation, courtesy of Hasu. It makes the board fully programmable. More info on that can be found on geekhack. The best part about this keyboard though is that all of these add ons are purely preference. 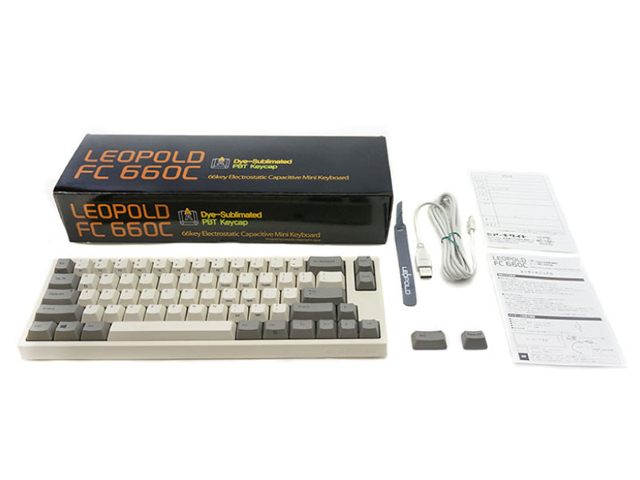 A lot of people agree that you can't go wrong with a stock fc660c, if the layout appeals to you. The aesthetics are minimalistic, but the board has a classy look to it that isn't really conveyed in these photos. If you are hesitant about the price, these boards generally sell for 200-250, (mechmarket on Reddit is the best for selling niche boards,) so if you don't like it down the road you can always get most of your money back. Really great keyboard. Before I bought, I had doubts about the relation quality/price. but now i must say it is the best keyboard I ever used. Also great costumer service for mechanical keyboards. Beautiful keyboard -- moreso than the pictures suggest. Build-quality and keycaps are both superb. My non-complaints are that the Backspace key isn't in the same place as on the HHKB (but hey, different board different rules), and I wish I could have bought this in a 55g configuration. I've got a HHKB Pro 2 that I've dome-swapped, and will probably do the same for the Leo, but I would to not need to buy another Realforce 87u. I might be an enthusiast, but I ain't made of money. The insert and delete keys look a little weird floating off on their own though.